Welcome to Ken Shaw Lexus, your certified Lexus dealership in Toronto, Ontario. We are presenting the new 2018 LC. You can find all the relevant information below. Enjoy! Combining exciting design and exhilarating performance like never before, the all-new Lexus LC 500 and LC 500h luxury coupes give Canadians new reasons to fall in love with the adventure of the wide-open road. 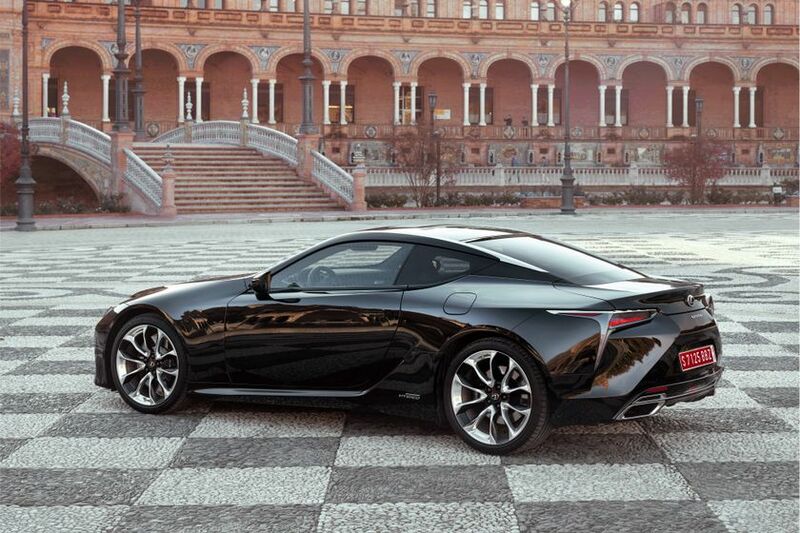 The LC series – available in both conventional (LC 500) and hybrid (LC 500h) versions – is a flagship 2+2 luxury coupe that expresses a contemporary interpretation of the finest traditions of the grand touring model. The LC is focused on the road, with handling, responsiveness and comfort tuned on some of the world’s greatest driving adventures to deliver a rewarding and hugely enjoyable experience. Lexus is known for the craftsmanship of its vehicles, and nowhere is this more apparent than with the new LC series. 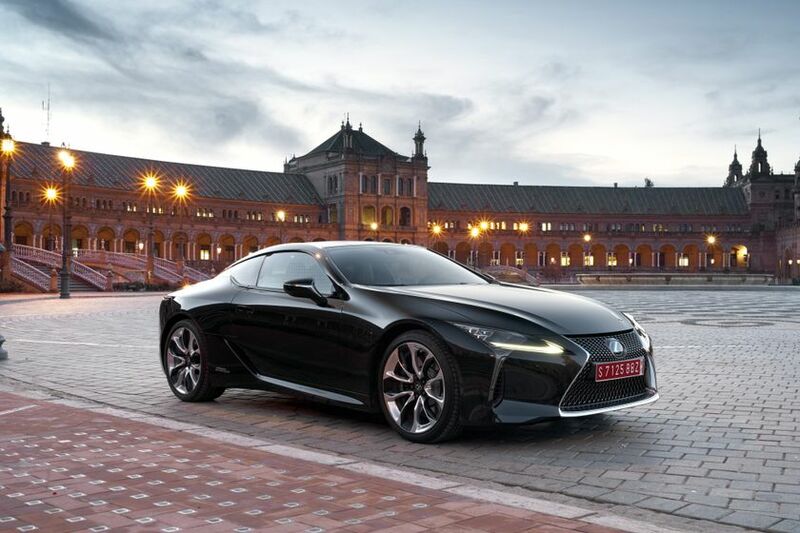 Lexus builds this new flagship model at the same plant that produced the hand-crafted Lexus LFA Supercar – and many of the people who built the LFA have transferred to the LC production line. Their expertise is apparent in everything from powertrain function to interior and exterior trim. The LC 500 is powered by the latest iteration of the Lexus 5.0L V8 that graces both the Lexus RC F and GS F high performance models. High-revving and naturally aspirated, this 471 peak horsepower engine provides exhilarating acceleration for confident driving. This is coupled to a 10-speed direct-shift automatic transmission – the first in a luxury automobile – that delivers amazing shift times, heightening the emotional connection between driver and car. This 10-speed automatic features evenly-spaced gearing and is the industry’s first to combine AI-SHIFT control with a drive-mode switching function, to select the optimum gear according to the vehicle’s estimation of the driver’s preferences and intentions based on vehicle speed, use of the accelerator, and past driving history. The LC 500h is revolutionary, introducing an all-new Lexus Multi-Stage Hybrid powertrain that’s been designed specifically for high-performance vehicles. Built around a 3.5L V6 and a state of the art Lithium-Ion hybrid battery, this hybrid system delivers 354 hp and impressive torque figures across a wider range of engine speeds. It’s coupled to a continuously variable transmission mated to a four-speed automatic gearbox to closely align engine RPMs with throttle inputs. LC 500h drivers can manually select from 10 speed steps to deliver a surprisingly sharp connection between the accelerator pedal and vehicle response. Lexus recognizes that all the senses contribute to an engaging driving experience – including sound. That’s why the new LC’s powertrain has been carefully tuned – from air intake to final exhaust – to create a “concert hall” effect inside the cabin, both as the LC gains speed and slows down. At low revs, the sound telegraphs the LC’s power, while at higher speeds the engine note contributes to the LC’s exhilarating experience. 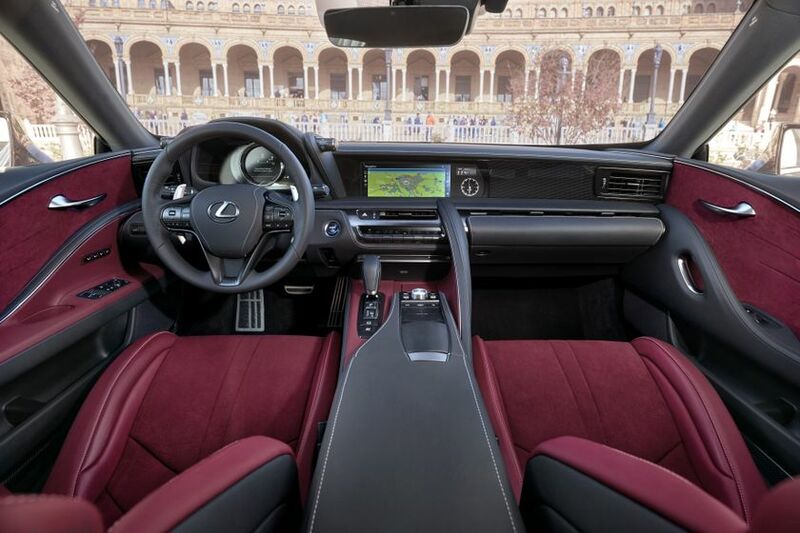 The LC 500 and the LC 500h (hybrid) comes equipped with Lexus Enform destination and concierge service and a full suite of the latest safety technology (smart cruise control, lane-keeping assist, pre-collision warning, etc.). The LC series is the first Lexus to take advantage of an all-new, rear-wheel-drive platform. Known as GA-L, this platform features a low centre of gravity and centralized positioning of components, including the engine. 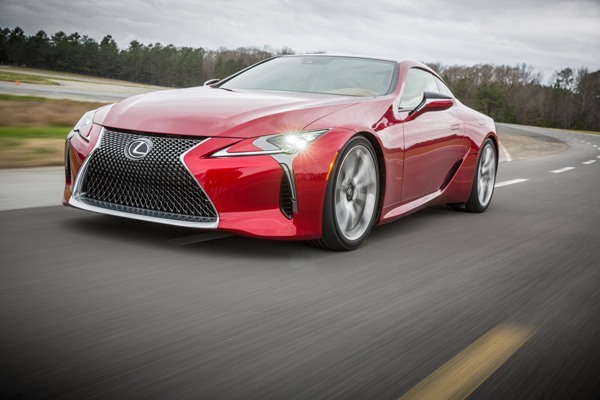 The result is a dynamic driving experience unlike any previous Lexus. New front and rear suspensions contribute to excellent vehicle response and sharp, agile steering feel, while imparting tremendous ride comfort and stability. Run-flat tires mean no on-board spare is necessary. This helps better balance the vehicle’s weight and frees up space to help maintain the LC’s swooping profile. The LC series features a design – inside and out – that’s immediately recognizable as being a masterful interpretation of the LF-LC concept, first revealed to public and critical acclaim at the 2012 North American International Auto Show. Lexus design and engineering teams worked together with an unprecedented degree of cooperation to translate the concept car’s styling into a practical proposition for a full production car, without compromising on the qualities that enamored auto show visitors. 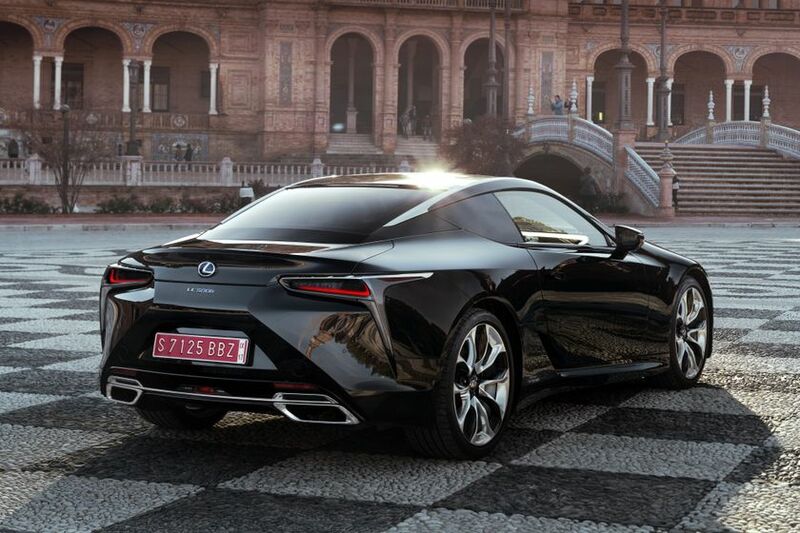 The LC features luxury coupe proportions with an exterior design that projects avant-garde elegance while remaining faithful to many of the defining features of the LF-LC that inspired it. The LC series is wrapped in a glamorous body that represents an evocative and fluid interpretation of the Lexus “seduction and technology” design theme. The profile is athletic, with a sweeping roofline and distinctive silhouette. Prominent front and rear spoilers flare away from the centre of the car, housing wide, large-diameter wheels. At the front, the signature Lexus spindle grille is flanked by unique, remarkably slim lighting clusters – while at the rear, the combination tail lamps emphasize the vehicle’s wide and stable stance. Detailing is beautiful and aerodynamic, improving high-speed stability and ride quality while suppressing wind noise. Inside, the LC features a flawless finish and attention to detail. Precisely-stitched leather spread across complex surfaces. 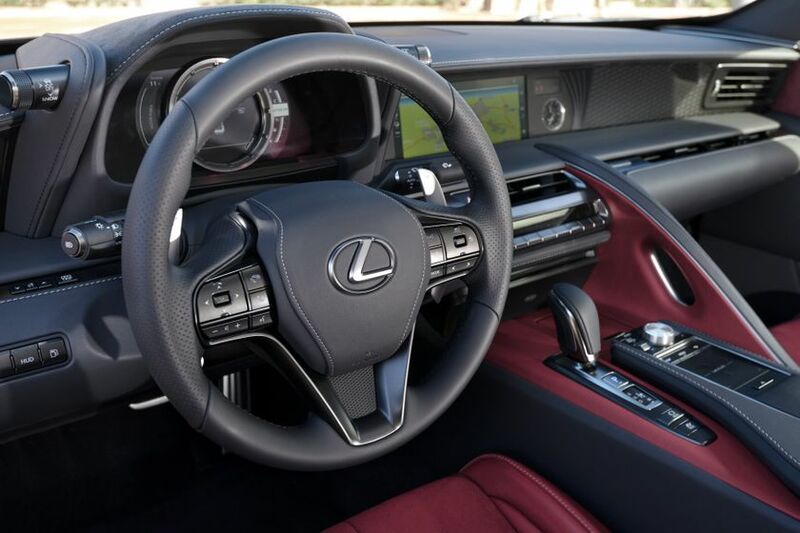 All-new designs for the steering wheel, paddle shifters and shift knob perfectly communicate the quality of the LC’s performance to the driver’s hands. The cabin environment is driver-focused and carefully designed and crafted to be a perfect as possible for all occupants. The LC also features a full package of active and passive safety systems, including the Lexus Safety System + as standard on all models. This package includes the Pre-Collision System, all-speed Dynamic Radar Cruise Control, Lane Keeping Assist with Lane Departure Alert, and Automatic High Beam functions.